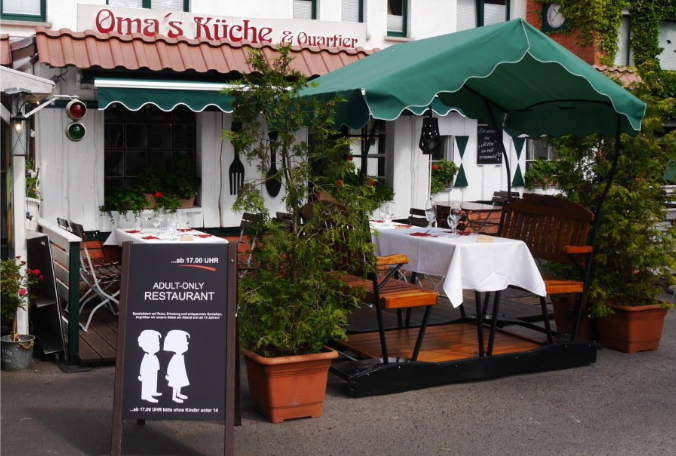 Although many European vacation hotels already have an ‘adults-only’ policy in order to offer couples without children tranquillity during their holiday, many in Germany reacted with mixed anger and surprise when a typical restaurant called "Oma's Küche" on the German island Ruegen, decided to install a likewise policy for its dinner hours. Whereas during lunch they are still allowed, for the dinner reservations you won't be allowed in if you're under 14 years of age. The decision has caused uproar in Germany. His breaking point was reached when some unruly children damaged the inventory in his restaurant on the German Baltic Sea island of Rügen. The rampage of running children left the antique photo stands in his Oma's Küche restaurant damaged. The parents "acknowledge it with a smile, keep on eating, and don't care at all," according to Mr Markl. He furthermore explained that his decision to ban children after 5 pm CET is not aimed at children, but rather at ignorant parents "who cannot control their children." Mr Lars Schwarz, the head of the Hotel and Restaurant in the German state of Mecklenburg-Western Pomerania, which includes the island of Rügen claims that businesses in the state are free to decide whether or not children are allowed on the premises although he wished that the restaurant would have decided otherwise as "in this state we aim to be friendly to children." Many German mothers expressed their outrage online over the growing policy of hotels (and now also restaurants) to offer the adults only policy, with Germany's Anti-discrimination Office receiving several complaints. The office claimed that the decision indeed raised some legal concerns. Its spokesman, Mr Bernhard Franke: "the arguments such as the higher noise level that would disturb the guests are not necessarily enough for a wholesale ban on children below a certain age." Why am i picturing Augustus Gloop and his fatass parents from that Chocolate Factory movie with Gene Wilder?